Although the most common way to represent a point in a plane is in terms of its distances from two perpendicular axes, there are several other ways. 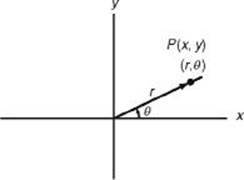 One such way is in terms of the distance of the point from the origin and the angle between the positive x -axis and the ray emanating from the origin going through the point. In the figure, the regular rectangular coordinates of P are (x,y) and the polar coordinates are . If r > 0, it is measured along the ray of the terminal side of . If r < 0, it is measured in the direction of the opposite ray. x2 + y2 = r2, using the Pythagorean theorem. Unlike the case involving rectangular coordinates, each point in the plane can be named by an infinite number of polar coordinates. 1. (2,30°), (2,390°), (2,–330°), (–2,210°), (–2,–150°) all name the same point. In general, a point in the plane represented by can also be represented by or , where n is an integer. 2. Express point P, whose rectangular coordinates are , in terms of polar coordinates. Therefore, = 60°and (6,60°) are the polar coordinates of P .
3. Describe the graphs of (A) r = 2 and (B) . Therefore, x2 + y2 = 4, which is the equation of a circle whose center is at the origin and whose radius is 2. (B) Since and , y = 1. The domain of is all real that are not multiples of . Thus, is the equation of a horizontal line with holes in it at multiples of one unit above the x -axis. Both r = 2 and are examples of polar functions. Such functions can be graphed on a graphing calculator by using POLAR mode. Enter 2 into r1 and graph using ZOOM 6, the standard window. Although the graph is accurate for the scale given, the shape looks like that of an ellipse, not a circle. This is because the standard screen has a scale on the x -axis that is larger than that on the y-axis, resulting in a distorted graph. The graph below is obtained by using the ZOOM ZSquare command. 3. Describe the graph of .